push her car through the snow. 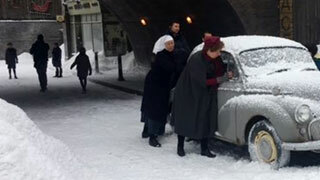 While England was recently undergoing a heat wave, the cast of Call the Midwife were having to don heavy cloaks and woolly jumpers as they filmed this year’s Christmas Special, which is set during Britain’s "Big Freeze" of 1962/63. That extended episode is now complete and filming is underway on series seven. 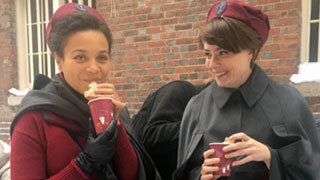 Along with releasing some delightful photographs of the Midwife cast hard at work on the next season, the show’s producers also announced that three major characters have left the show. Namely, Bryony Hannah who played Sister Mary Cynthia, Emerald Fennell who played Patsy Mount and Kate Lamb who played Delia Busby. Ben Caplan, who played PC Peter Knoaks, is also missing from the next series having left the show a couple of months before the ladies announced their departure. 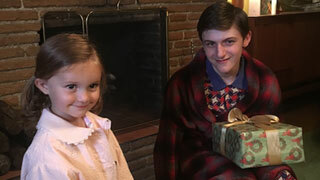 Max MacMillan and Alice Brown. 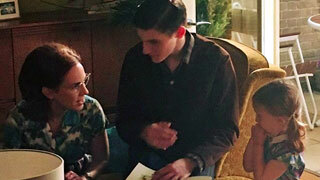 Caplan, who had been with Call the Midwife since the series began, left in order to pursue other acting opportunities. This year, for instance, he had a starring role in the second series of Maigret, starring Rowan Atkinson as the fictional French detective. Ms. Fennell reportedly left to focus on her writing but we’ll be seeing her next year in the second series of the Masterpiece hit Victoria. Alice Brown and Max MacMillan. No word as to what Welsh actress Kate Lamb will be up to, but Bryony Hannah, who was with the series since season one, is currently appearing in a brand new play in London called Twilight Song. Also in the play is Philip Bretherton. As you can see from this short video clip about the play he’s in, Mr. Bretherton is a lot greyer than we’re used to seeing him in As Time Goes By. Joining the Midwife cast for season seven is a brand new character – a West Indian nurse called Lucille Anderson, played by Leonie Elliott. According to series creator Heidi Thomas the new character will be “elegant, funny and clever”. Mmmmm….sounds a lot like Alistair in As Time Goes By if you ask me! That perennial favorite airs weekday afternoons at 3pm on Afternoon Tea.